This is a more complete 'Down the Mekong' tour taking in the fantastic northern Mekong but also a full exploration of the south on board the luxurious 'Vat Phou Cruise.' A popular way of entering Laos is by crossing the Mekong in northern Thailand to catch a slow two-day boat downriver through inaccessible wilderness arriving in Luang Phabang at dusk. The boats are 15 metres long by three metres wide with one long wooden hull where all passengers backpacks and supplies are stored protected by a flat tin roof. The boats are powered by a recycled lorry engine mounted in the back of the boat. Two large openings on either side of the boat let fumes out fresh air in and people up onto the flat roof to languish in the smoky sun under a gentle sky and watch the world drift by. The Luang Say Cruise boat leaves Houei Say pier at 09:00 hrs for a cruise down the Mekong to Pakbeng. En route one stop is made to observe rural life along the Mekong and visit minority ethnic groups; then, a buffet lunch on board. Arrive Pakbeng before sunset and check-in at LuangSay Lodge. You can then enjoy dinner on the terrace overlooking the Mekong River. Your half day city tour begins with a visit to the Royal Palace Museum, which hosts a range of interesting artifacts. We then head to the magnificent Wat Xiengthong with its roofs sweeping low to the ground, which represents classical Laotian architecture. We also have time to visit the impressive stupa of Wat Visoun and the shrines of Wat Aham and Wat Mai. In the afternoon we will visit local villages of Lao ethnic minority groups at Ban Ouay, a Hmong village, Ban Ou a Laoloum village and Ban Thapene, a Khmu village. This then takes us to the beautiful Khouangsi Waterfall where you can cool off with a refreshing swim in the pools or walk along the forest trails. We then return to Luang Prabang by early evening. You will be transferred to the airport for your flight to Vientiane. Check in hotel, then embark on half day city tour to see the major temples of Vientiane including the oldest, Wat Sisaket, a temple of thousands of miniature Buddha statues, and the former royal temple of Wat Prakeo, which previously housed the famous Emerald Buddha Image. We also visit Lao national icon, That Luang Stupa, and we stop to take some pictures of the imposing Patuxay Monument, which is Vientiane’s own Arc de Triumph. You will depart Vientiane early for your 6.30am flight to Pakse. 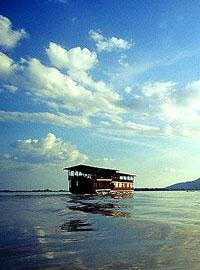 On arrival you will be met and transferred to the Vat Phou Cruise leaving Pakse for Champassak at 10:00am. Once on board, we head south, arriving at Champassak in time for a riverside lunch, followed by a guided tour of the mysterious pre-Angkorian 10th century temple of Wat Phou, the boat’s namesake. As dusk falls, we board the Vat Phou for a relaxing cruise down-river, enjoying the tropical sunset on the deck. Dinner is served on board, while the boat docks for the night alongside a remote Laotian village. After breakfast on board, we set sail for the village of Huei Thamo, only a few minutes walk away from the spectacular hidden Ancient forest temple of Oum Moung. We rejoin the boat for a leisurely cruise southbound and enjoy lunch on the deck, continuing south to the wild paradise of the “4,000 islands” region. In the afternoon we will arrive at Ban Dua Tae, a traditional Laotian Village where the traditional way of life has not changed in centuries. We observe traditional village life and learn about the daily activities within the village. This evening we enjoy a quiet dinner on board, under the stars, serenaded by the songs by the songs of the buffalo toads. Today we will enjoy breakfast on the upper deck, while cruising to the small village of Ban Veuthong, where we will board a small long tail boat to Khong Island, the largest island in the 4,000 islands region. After visiting the island, we take a long tail boat back to the mainland for lunch amid the bygone splendid of another age; colorful French colonial houses and an old customs post, alongside a stone quay. We will transfer by minivan to the encaptivating, scenic splendor of the Khone Phapeng waterfall, “the Niagara of the East“, close to the Cambodian border. We return to Pakse for “civilization”, which is a two-hour journey by road, arriving in the late afternoon.